I don’t know how to talk to women. Seriously, I’m 51 years old and still have no clue. Yesterday I was downtown, wearing a nice kilt (Royal Stewart tartan) and I was walking my new puppy. I was on the sidewalk and I noticed an attractive woman passing behind me. She stopped and approached. “What kind of puppy is she?” she asked. “She’s an Australian Shepherd” I said. 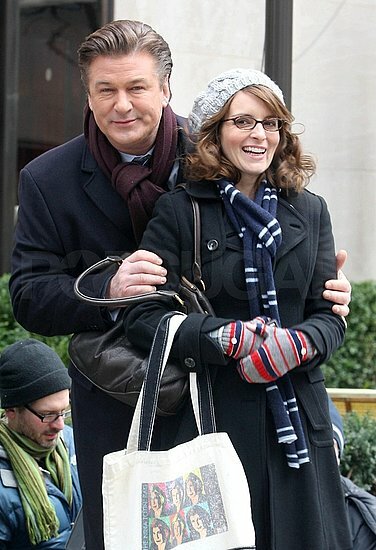 The real Tina Fey with a more confident Baldwin. “That’s cute” she said, petting the puppy. “What’s your name?” she asked, looking right at me. I noticed at that point she looked a lot like a young Tina Fey. I’m bad with ages but she could have been 30. Possibly 27. Maybe 32. Young Tina Fey was petting my puppy. And she wanted to know my name. I could feel myself starting to close up. Why did Young Tina Fey want to know my name? I’m not in any shape for a relationship, I just got out of one. And 30 is too young for me. I guess it would be harmless to go for coffee though. I’m going to have to Febreeze my car before we go anywhere. What, does she want kids? Crap, she may already have kids. How can I afford a big house right now? How much does it even cost to send a kid to college now days? I’ll bet that cost will double in 18 years! Then Young Tina Fey walked away. I crossed the street, mentally pounding myself in the head. I didn’t even ask her her name. I have no idea if she was interested in me or just being friendly but most likely she was just a nice girl trying to have a casual conversation with a stranger. Instead she encountered a dork. With zero social skills. In a kilt. Walking a puppy. I felt bad for her. I felt bad for me. I started hoping she would go home and Google “Rick, kilt, puppy” and by some chance land on my Facebook page. She would contact me and I could apologize for not asking her name. I could suggest we meet for coffee where we could discuss Australian Shepherds. Tina Fey. Maybe even how many kids she wants someday. Good lord, I can’t afford a big house.